Analog synthesist Harvey Sutherland emerged from Melbourne’s bubbling underground with a cassette tape in hand. The lo-fi boogie and Roland house music of 2013’s Nexus EP was a cult hit amongst dancefloor aficionados, priming listeners for a lauded EP on Echovolt Records and the best-selling ‘Brothers’ on Voyage Recordings. His music has been played and appreciated worldwide, with support from tastemakers Bradley Zero, Tom Noble and Motor City Drum Ensemble. 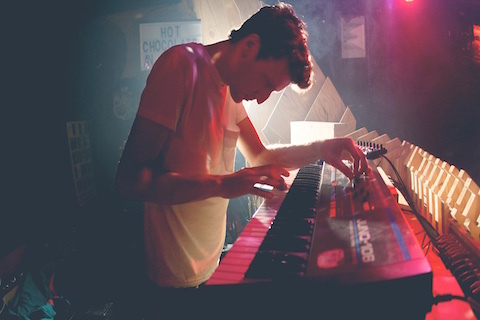 He was named one of FACT Magazine’s “Australian Electronic Artists to Watch in 2015” and made his European debut in May 2015 with an 11-date club tour. His 12” ‘Bermuda’ finds a welcome home on the legendary MCDE Recordings; two modern disco cuts that reflect the tastes of the label’s eponymous selector, but are undeniably Harvey. Sutherland’s improvisational live show – equal parts 808 rattle and double disco clap – is an evolving, synthetic boogie exploration. Manning the controls of the mighty Juno 60 synthesizer, Harvey sweats it out with the crowd, looping new phrases and modulations, pitch-bent solos and the occasional Janet Jackson cover into a heavy four-to-the-floor throwdown. In anticipation of a forthcoming record, 'Expectations', Sutherland introduces a new live formulation – a futurist disco trio featuring Melbourne players Graeme Pogson on drums and string maestro Tamil Rogeon. 'Expectations' is an extended player from minimalist disco outfit Harvey Sutherland and Bermuda. The second release for Sutherland’s own Clarity Recordings brings his Bermuda project into sharp focus - six tracks spanning Harvey’s influences from the West Coast to West End Records.